The Southern Highway had been closed sometime before we got to town following a massive bushfire earlier a month earlier. We were planning to drive east and use the inland detour. When we left Parry Beach we headed to Denmark, filled up with petrol and headed east out of town. We found ourselves further down the road than we remembered the detour was, maybe we had just missed the detour sign. We chucked a U-turn and headed back into Denmark. That’s when we read the sign that advised that the Southern Highway was open again! Apparently they had re-opened the road at midnight the night before, so we were one of the cars through on the first day the road was opened. It was quite unsettling driving through the charred timber, sometimes still smoking. The devastation and destruction of the fire stretched for 85,000ha from the highway to the coast. We drove on through the forests until we reached Pemberton where we stopped for the night. A quick walk saw us cover most of the town. They seemed to cater well for travellers as there was a nice park with BBQ’s and public conveniences that looked well maintained. 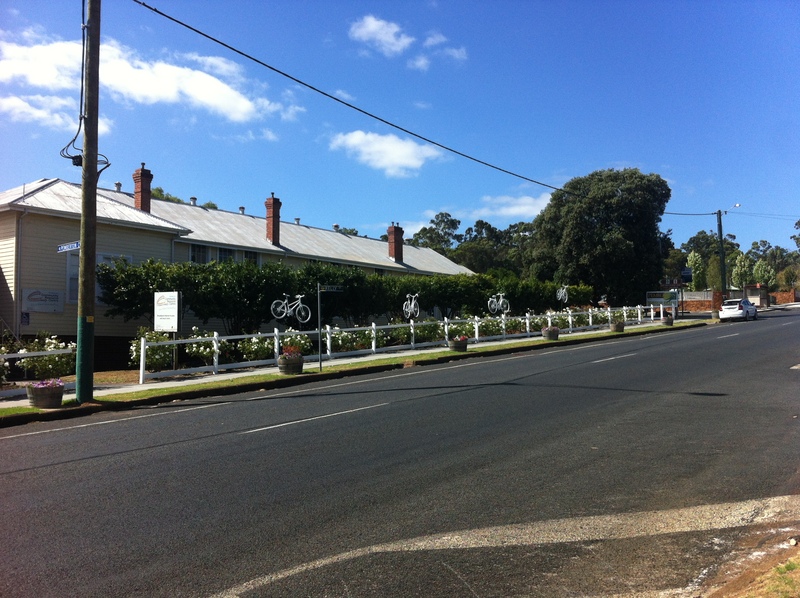 There were a number of bike frames that had been sprayed white and were being displayed on along the main road. Apparently this area is very popular with cyclists and there was a large cycling event being held on the upcoming long weekend. The next day we set out to see the Gloucester Tree, the reason we had stopped here. This is one of the many trees that used to be used as a fire watch station throughout the fire season. It is a Karri tree that is over 60m tall. All the limbs have been removed to allow for metal rods to be inserted into the trunk to form a spiraling ladder up the side of the tree. At the top the crown of the tree had been removed and a wooden platform and roof constructed. The old timber observation hut has since been removed and replaced with a metal construction. Craig’s knees had been giving him some trouble so he didn’t attempt the climb. Emma managed to get around 15 meters up before chickening out. Instead we did a walk around the forest, which was cool and tranquil. If you’re keen for tree climbing there are two other Karri trees in the area that can also be climbed.